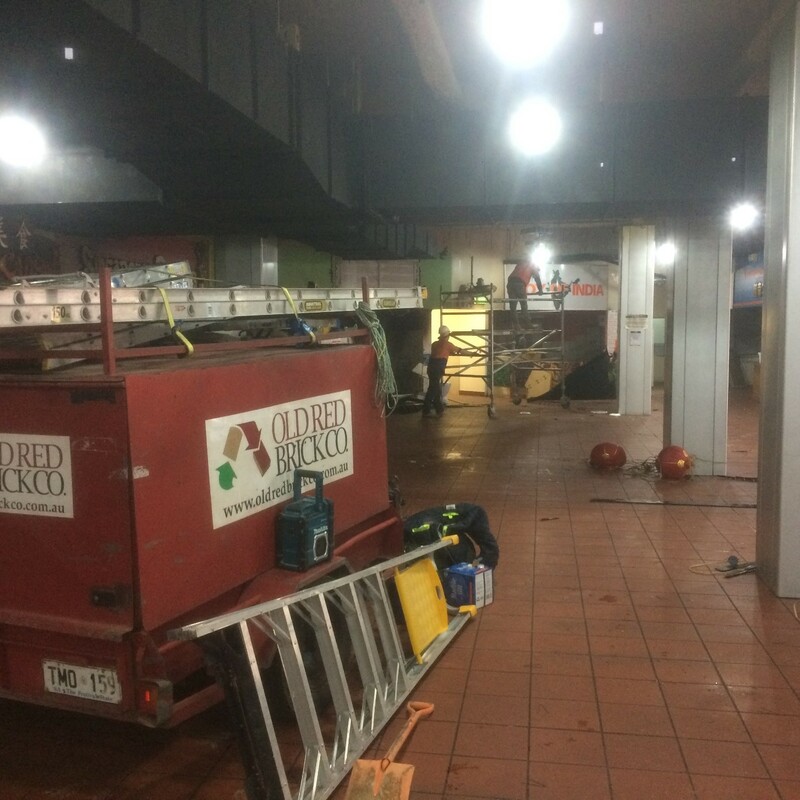 ORBC Staff beginning internal demolition of the China Town food court in Moonta Street Adelaide. One of the areas of demolition that the Old Red Brick Company specialises in is that of internal demolition for new fitouts and refurbishments. Throughout the course of the last decade we have worked with most of South Australia’s major building companies on a broad range of projects throughout the greater Adelaide region. Our portfolio of works includes working in offices both single and multistorey, local council buildings, schools, warehouses, churches, hotels, hospitals and even the Adelaide Airport. Our recent list of refurbishment works include the refurbishment of China Town Food Court on Moonta Street Adelaide, 17A Rundle Mall Adelaide, SA Police Health Adelaide, St Thomas School Goodwood, St Andrews School Walkerville and 2 four story internal removal works in office blocks in Adelaide City Centre. 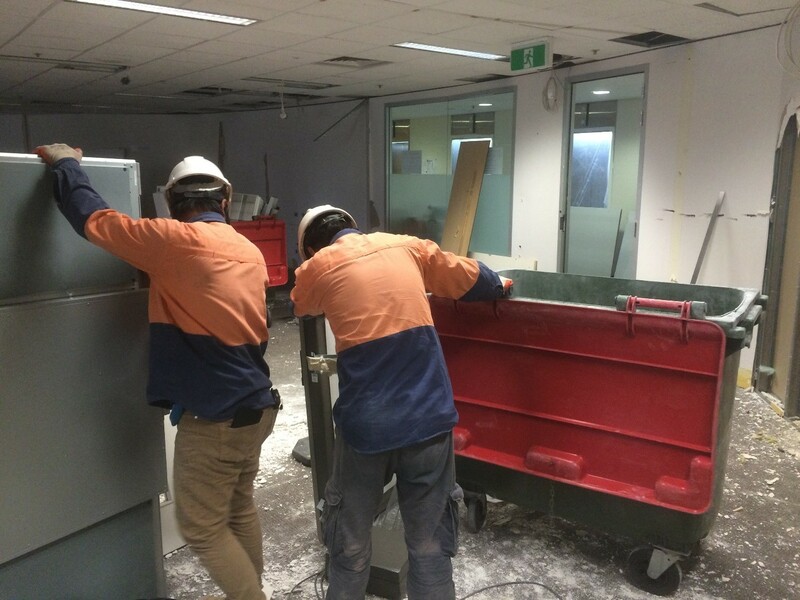 Our staff has extensive experience in areas such as removing internal partition walls, wall and floor penetrations, needling and propping walls, asbestos removal, removing roofing, ceilings & floor finishes and concrete grinding. We also have experience with more technical aspects of demolition such as removing suspended slabs, removing stair cases & elevators, working at heights and operating in areas with limited access or space. We have both the staff and the equipment necessary to complete all demolition projects. Our light plant and equipment include, mini-excavators, skid steers, roll-on roll-off bins, light trucks & utilities and a range of concrete cutting equipment. We also have the specialised concrete cutting equipment such as road saws, electric demolition saws and pneumatic jackhammers for large scale concrete removal work. Our team understands the modern building environment where maintaining a positive public image is crucial, OH&S is paramount and meeting timelines is imperative. We also appreciate the need to work with other trades and the importance of establishing a strong working relationship with the builder in control of the overall project.